Confusingly, either zucca or zucchetta can mean any number of varities of squash, pumpkin and decorative gourd. They're a standby all over Italy, in soups, pies and tarts, and especially as a filling for pasta, such as Mantua's tortelli di zucca. The flowers, like those of courgettes, are popular stuffed with ricotta and deep-fried: fiori di zucche. barucca veneta: big, round, yellow and gnarly (the name means 'warty') but a favourite in the kitchen. berettina piacentina: grey-green, looks like it's wearing a beret. bottiglia del pellegrino: 'pilgrim's bottle'. The only native Italian gourd, this was indeed used as a container for liquids in the old days. pumpkin padana: beautiful orange and geren stripes. serpente di Sicilia: see cucuzza. zucca cedrina: white fleshed pumpkin, similar to the anguria bianca and often used to make jam. zucca delica: green, round or slightly flattened pumpkin. zucca di Albenga, or tromba, trombetta di Albenga: huge, elongated green or orange squash. zucca di inverno: big tan-coloured variety that will keep in a dry place through the winter. zucca di Maura grigia: grey, one of the biggest (up to 35 kilos). zucca di Napoli: long, green or light orange and hourglass-shaped. zucca marina di Chioggia: a big bluish, ugly, lumpy pumpkin, considered by many the best for cooking. zucca violino: round orange squash. 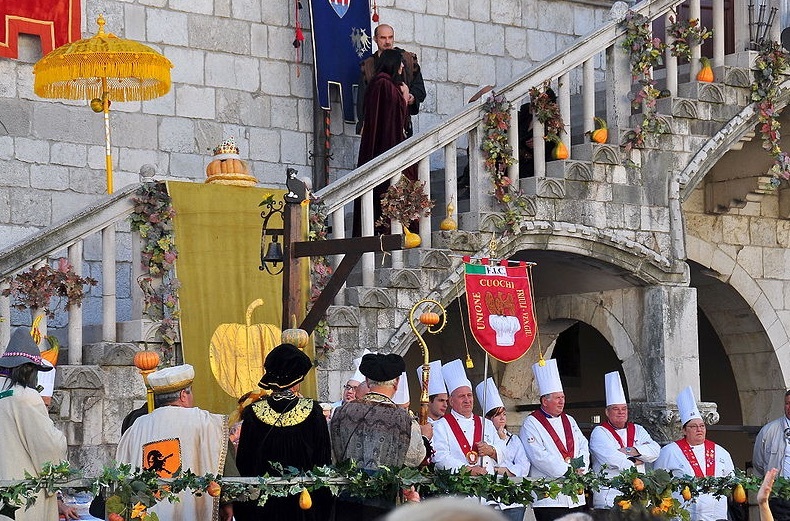 Venzone in Friuli Venezia Giulia holds its annual Festa della Zucca on the last weekend of October, with every imaginable pumpkin related activity, in medieval costume with a Duke of Pumpkin in charge of proceedings. The legend goes that after building Venzone's cathedral and campanile, the local lords didn't have quite enough money for the finishing touch--a bronze spire with a shiny golden ball atop the bell tower. When the master builder from Udine finished the work and asked to be paid, the lords told him he should have been happy just for the honour of working for them, and offered him only a third of his fee. The builder humbly thanked them, but that night he climbed the scaffolding of the campanile and replaced the ball with a large pumpkin painted gold. The next morning he took down the scaffolding and returned to Udine. Soon after the golden ‘ball’ began shedding chunks on people’s heads. Unfortunately for Venzone, folks from a nearby village were passing through, and eagerly told all how the Venzonesi had been outsmarted.